We are living in the most accessible age of film creation in all of time. You might say, “sure Levi, of course we are, technology is progressing as it always is.” But take a moment and reflect with me over what has changed in just the past decade of indie filmmaking. We went from having video cameras equipped with tiny censors that produced a very ‘digital home video look’—to large sensor cameras that enable a more ‘filmic’ aesthetic. All in the the span of six years or so. I want to start off this post about cameras by saying, the cameras you shoot with don’t make you a better filmmaker. That is the biggest take away. That is the only message I really care about in this gear heavy post. 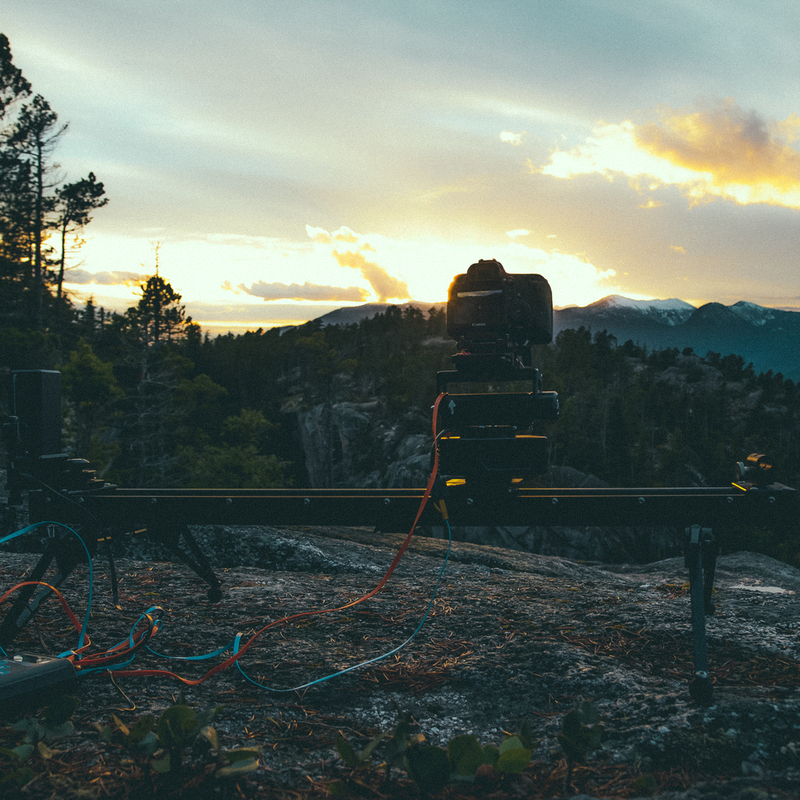 Those of us who tend to get into filmmaking have a huge interest in the technical side of the filmmaking process. That is most likely why you are even reading a post like this to begin with. Don’t get me wrong, I love cameras, I could talk cameras, codecs and bitrates for days. But when it comes down to it I have to acknowledge at the top of this post that the camera is not going to help you tell a better story. In my recent documentary project UNTETHEREDI got to shoot with a lot of different cameras to help make this project happen. I learned a lot about what you need and don't need to actually capture your stories in a visually pleasing way. I love good cinematography and I believe you can achieve this with a semi-minimal setup. If you were going to make any sort of adventure film tomorrow and need a camera, I would tell you to buy the Panasonic Gh4.Hands down this is the best value per buck in the game. Coming in at well under two thousand dollars new, this camera is a 4k workhorse. The Gh4 was one of the cameras I borrowed on this production and I put it to some serious use. It surprised me to be honest. The clarity, resolution and flexible dynamic range really made this a super functional camera for me. If I could have had my perfect situation, every camera used in the film would have been a Gh4. It is such a light and flexible kit. 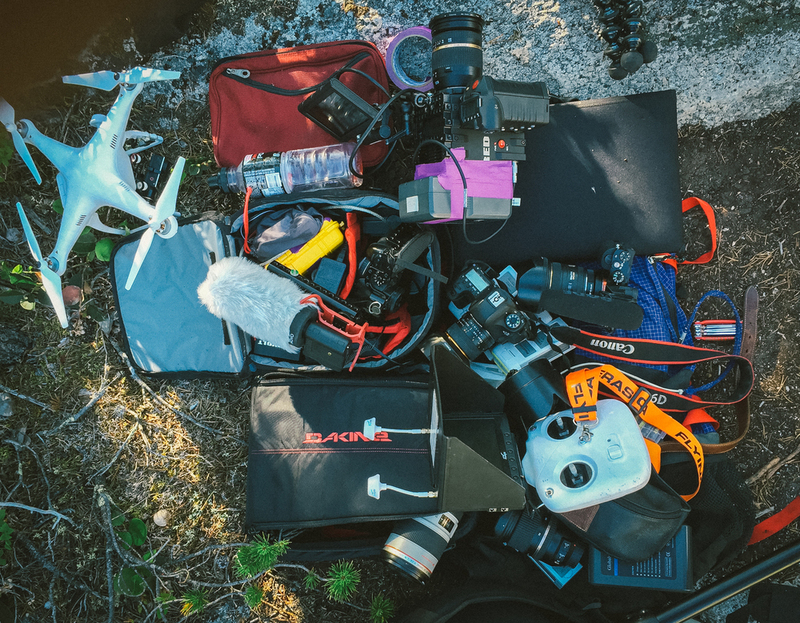 Even if you have enough money to purchase a larger 'proper video camera,' like a c100 or fs5, I would still strongly recommend buying the GH4 and using your left over funds for other pieces of support gear, or lenses. If you have well over 10 Grand to spend on gear, that changes this advice slightly, but if you are like me and making your own self funded projects, I can't speak more highly of this powerful little camera. That's my advice right off the top, and that's what I took away from a project that was shot with many different cameras. I am now going to dive into explaining all of the cameras used on my film, and the different things I learned throughout. If you have any questions drop down to the comments and let me know! I Borrowed Every Single Camera. When I started this project I decided I really only wanted to use my Canon 60d for timelapse photography. I knew it wasn't capable in video mode to do justice to some of the beautiful landscapes we would be shooting in. I didn't have enough money to buy a new camera at the time, so I looked for any ways possible to borrow cameras in my different stages of shooting. I shot for people for free in exchange to using their camera later. For this reason the project had over 12 cameras involved in the production, YIKES! That’s kind of what happens when you don’t have one specific camera of your own to shoot the entire film with. It definitely was not ideal having this many cameras, but with the help of my post wizard friend Ryan, we were able to get a consistent look and feel across the entire film. Lets look at the stats and then dive into the specifics of the cameras for this film. The camera I had in my hands the most while shooting this film was the Panasonic GH4. This was the first time I had put one of these guys to use and I was really impressed. In combination with a Metabones Speedbooster I was able to use all of the Canon Lenses I already owned and I was getting results I was really excited about. This camera ended up making up 33% of what you see in the film, but the total amount of footage shot on location with it out of all the cameras was at least over 50%. What I loved most was the size and flexibility. It was light enough that I could climb with it comfortably almost anywhere. This camera was also my biggest source of foley audio for the film. I had a Rode Video Mic mounted on it the entire time and I am super happy with the sounds I was getting out of it. 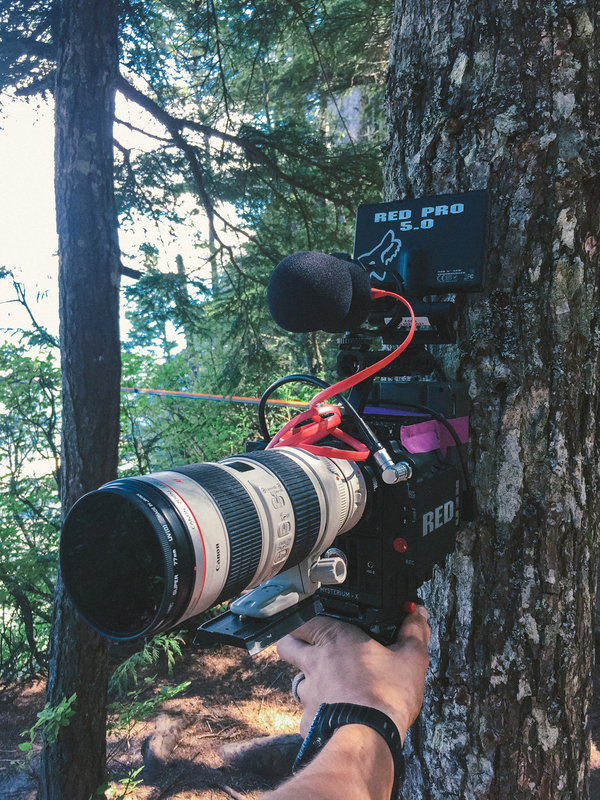 If you hear a slackline sound in the film, it was most likely audio captured by the GH4. I also used it for some on location interviews. I never once touched the audio meters and just left it in the auto mode. This is risky, but I wasn’t in a head space to keep making sure my levels were correct. I didn’t want to turn them up and then forget to have them back down and miss a really excited cheering moment. It performed really well in this auto mode. The windscreen I bought for it performed super well. I am really happy with the purchase. It was called the Movo WS160 and its available here on amazon for around twenty bucks. I purchased this mic mainly because it had the Lyre shock mount. This mount is far superior to the annoying elastic mount that the Rode mic's are famous for. At the time that I bought this mic the new Video Mic Pro with the Lyre mount had just been announced, and was not yet shipping. I still would have bought the previous generation because of the nearly 100$ savings in price. I also believe that it has better directional abilities because of the added length, but I could be off on that. I have yet to conduct a scientific test as I don't own the Video Mic Pro. I shot all of the set up interviews in this film on the RED Dragon. I was able to use this camera because I was working for a production company who owned one called Transposition Films. I am really thankful to have had the RED to use for these situations. I shot in 6k with at least 8:1 RC so I could easily crop in later in my 4k timeline. That’s why you see the Dragon being the second most used camera in the film. I wish in hindsight I had done a multi cam interview, but for all of the interviews I was running as a one man crew and there was enough to look after as it was. I talk more bellow why I regretted hiking the RED into the forest for the shooting in the mountains. The third most used camera on the film is the GoPro Hero4 Black and that is because I shot a crap tonne of aerial footage with the Phantom 2 from Dji. I really wanted this film to immersive components. I wanted it to feel as though you were spending a weekend in the mountains with these guys, and when they are at the height of their experience, there is a visual component to match. It's the reason I tried to do on location interviews to an extent, and it's also the reason why there is so much aerial coverage in the film. I wanted to achieve this flying feel to match what it must be like to have control walking a highline. I also wanted to give an over the shoulder glance down at what these athletes are actually seeing. The Phantom performed great for my needs. I needed to have something I could easily back pack into location, and get decent length flight times with. I ended up crashing a Phantom at one point in the shoot, but that's a story that deserves more than I have time to fit in this blog post. The other aerial setup used in the film is the far superior Inspire One with the x3 camera. This quadcopter is more capable in literaly every way. This drone is owned by Zachary Moxley. He shot the gorgeous world record footage as well as several shots in the opening sequence. I most often had the Tokina 11-16mm on the GH4. Especially while shooting from the edge of the cliff. I used the canon 70-200mm with 1.4x for close ups, and my Tamron 17-50mm VC for other all other coverage. For interviews I used my trusty Rokinon 35mm f/1.4. My shooting partner RJ Bruni most often had the 24-70mm from Tamron on his A7s, which is essentially the full frame older brother of my 17-50mm. In order to have a proper shutter speed and maintain a filmic look while filming outdoors, it's essential to get some sunglasses for your lenses. This is so so important to avoid that stuttery effect you see in so much footage. You might not think you can see the difference, but shoot two example shoots, one at 1/2000 and one at a proper 1/47th and you will see the difference. I launched into production of this film without much time or space to do any testing of picture profiles. Testing before hand is always ideal. This way you can see how different profiles respond to light, color, and how they behave when attempting to grade. I was only able to get my hands on the GH4 the day before heading out on the first 5 days of shooting. For this reason I avoided using any super flat picture profiles or things of that nature. I shot entirely in Cine-D. It is a common practice to shoot your footage with a flat picture profile to help save as much available data from the image as possible. This is a great practice, and I use it often with cameras that I have experience with, and when using them in a slower paced controlled shooting environment. I did not use flat profiles however. I already find it quite risky trying to expose and focus properly when using flat profiles. Especially when you are out in the sun and have a glare on the monitor. So I made the decision right from the top to try my best to get a balanced image in camera. I still didn’t do an amazing job with exposure, but I wasn’t about to leave it up to a flat profile I didn’t have any experience with. Because of the whole 12 camera thing, the process of grading this film was an additional challenge. Thankfully I had partnered with Ryan Shcroeder who lended his services to the project. Frankly he did an amazing job. I am really happy with how the film came out as a whole and think it has a very consistent and polished looked. Many have commented on the stunning visuals in the film, and I know this was pulled off in part by Ryan's nifty grading skills. On a fun note, I spent one full day sitting beside Ryan while he was grading, telling him which camera was which in the film. At least I'm useful for something. My Kessler Crane 2nd Shooter killin it with the timelapses. The timelapse portion of the film is enough for a post entirely of its own. So that's exactly what I'm going to do, that is one of the upcoming posts in this series. For quick reference the rig I used was a Kessler Crane 2nd Shooter for motion control. The cameras I used were both a canon 60d, and a canon 6d. If I could have changed one thing about production of Untethered it would have been shooting the entire film on just one or two cameras. I had access to a RED Epic MX to bring for the first section of shooting. Needless to say I was so stoked. My first project shot on RED, this is going to be so rad. However with brining the RED along into the mountains I bit off more than I could chew. There was frankly to much gear to properly manage and utilize fully. If I had enough batteries and RED Mags, I might have shot the entire doc on RED, but this wasnt the case. I had limited cards (2x 64gb) and it simply was not enough. I had even brought up my laptop to offload, but I ran into issues of my laptop battery draining. As much as I love RED cameras, If I could have done things over I would have left the RED kit at home for this mountain shoot. We were running as a two man team and had a lot of filming to cover, the RED simply was too much camera for the job. In hind site I would have rather had two GH4 kits up there and had one timelapsing the whole time, or have one getting locked off side angles. I would have loved to shoot the whole project on RED if I had enough power and media but I didn't. Lesson learned. More isn't better. I've learned more than ever that the end audience does not care about what camera the film was shot with. I think its obvious that pursuing the best form of our craft is important, but the craft should not intrude or trump the actual craft we claim to care about, storytelling. I had to make some tough choices in this film about including 1080p footage in a 4k project. I included the footage because I believe the content it ads is more important to the story than the 4k resolution. You know what, not a single person has mentioned that the 1080p footage stood out or distracted them. Not even other filmmakers. You will be able to find many a people on the internet that will tell you that I am wrong about this. But I've decided life's to short, and there's to many stories to tell to worry about those people. I've decided the only metric I care truly about is stories told that resonate with people. Period. That's it. I am committed to tell stories with excellence using the tools that are available, but a camera will never be a reason for me to say no to a story.